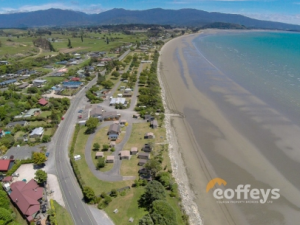 Pohara Beach is located about 10km northeast of Takaka, in a beachy village with a population that quadruples over summer. There you will find the amazing Pohara Beach TOP 10 Holiday Park. Situated on an incredible beachfront position, perfect for swimming or romantic strolls, with stunning views and endless entertainment. Up to 900 people per day can stay at Pohara Beach TOP 10 Holiday Park over the summer season. They have beds for every budget and offer; motels, self-contained units (ensuite and kitchen), to standard cabins and beachfront camping at its best with 202 power sites and 37 non-power sites. Six cafes and bars are within 200m of the Holiday Park.